Cinque Terre National Park is a protected area that covers five small fishing villages on the west coast of Italy and the landscape and waters between them. 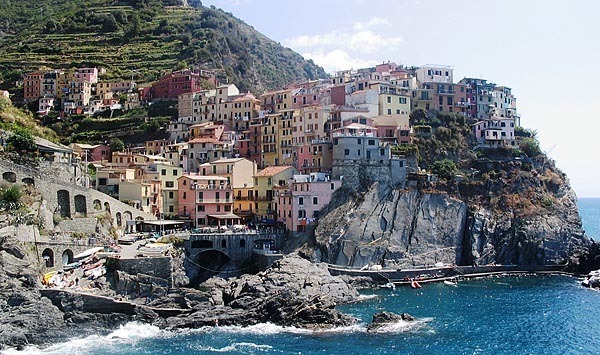 Cinque Terre is popular with tourists to Italy who want to escape from the big cities and flashy coastal resorts to a place where time seems to stand still. Cars are not allowed in any of the five towns of Monterosso, Vernazza, Corniglia, Manarola and Riomagiorre and sustainable agriculture and tourism is practiced throughout the region. The towns are connected by train or by a walking path that roams along the seaside cliffs, vineyards and lemon groves. Vernazza is a favorite among tourists with its picturesque harbor guarded by a tower built in 1318. There is also a fantastic restaurant atop the opposite hill of the harbor that serves fresh seafood and local specialties. Another favorite among the younger crowd is Manarola, pictured above, for its hostel but it is easy to find rooms for rent in all five of the villages. Buying a Cinque Terre Card will give you access to the train, the Via dell'Amor hiking trail and makes a contribution to the further protection of the landscape in the area. Last updated by Jennifer Rodriguez on 09 July, 2010 in Destinations. Nice place to hangout... sadly I missed to visit the park on my visit to Italy.